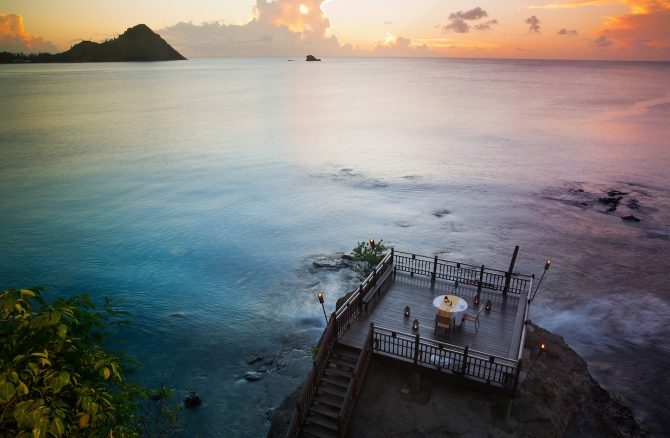 As we sip fruity cocktails, the sea breeze ruffling our hair, it’s no surprise that Rock Maison is known as ‘the most romantic table on St Lucia’. It’s a stunning dining spot; an ornate wooden deck built on a dramatic cluster of rocks jutting out into the azure Caribbean sea. Our table is adorned with tropical flowers as the setting sun baths the deck in a wash of gold and the waves gently crash around us. 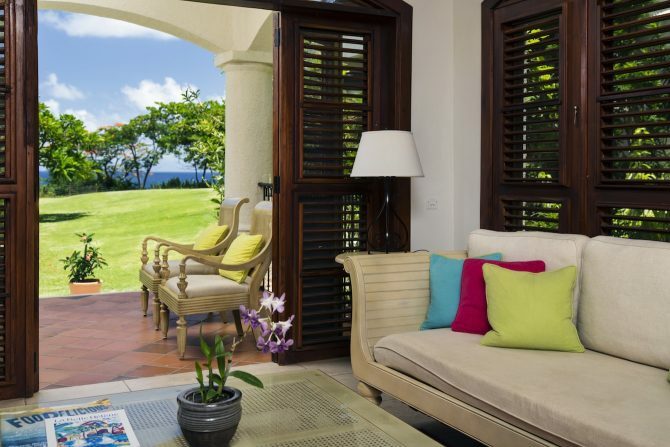 It’s accessed via a staircase from the cliff top above, nestled on which is our tropical hideaway for the week, Cap Maison, a 5-star boutique hotel and spa set in lush gardens filled with cascading cerise bouganvilla and fluttering hummingbirds. 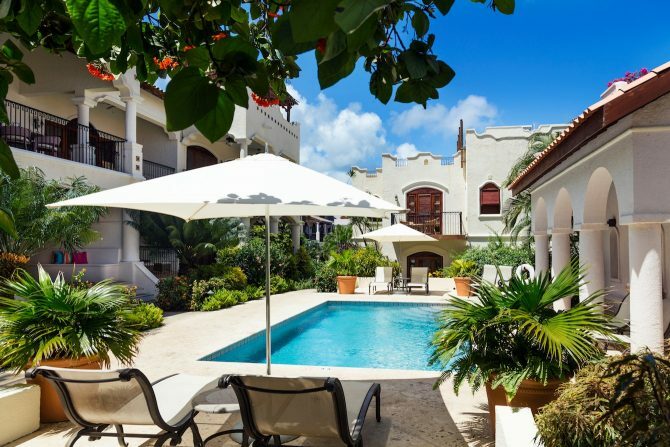 The luxe residence boasts stylish villas with twinkling private pools, fine dining restaurants, a secluded sandy cove, tranquil spa – even its own yacht for cruises around the island. But, as we sit here marvelling at the orange-streaked ocean, I can’t help feeling that Rock Maison is the jewel in the hotel’s crown. This intimate venue, where the sea meets the sky, hosts candle-lit dinners for honeymooners, couples massages and bespoke waterside weddings. 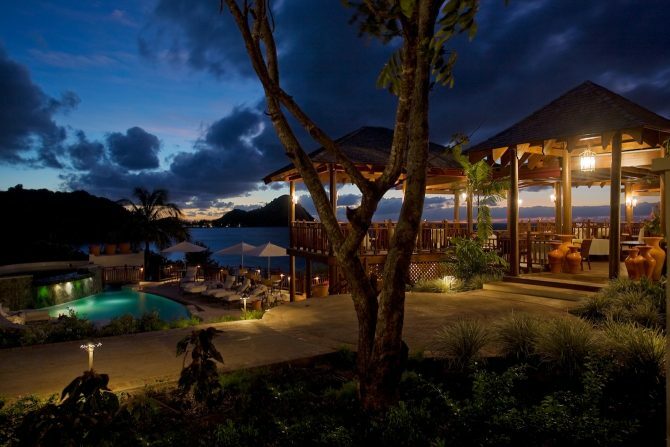 Drinks are served via bottles of chilled bubbly whizzed down directly to the table from the bar above along a ‘Champagne zip wire’ – the first and only in St Lucia. Flying fizz? Now, that alone is enough to get your heart racing! Yet, far from being gimmicky, Rock Maison encapsulates the very ethos of this intimate family-owned hotel – to offer a unique, personalised experience worlds apart from the identikit holidays offered by mainstream resorts and big chains. Here you won’t find all-you-can-eat buffets, uniform magnolia rooms and 24/7 animation. Oh no. 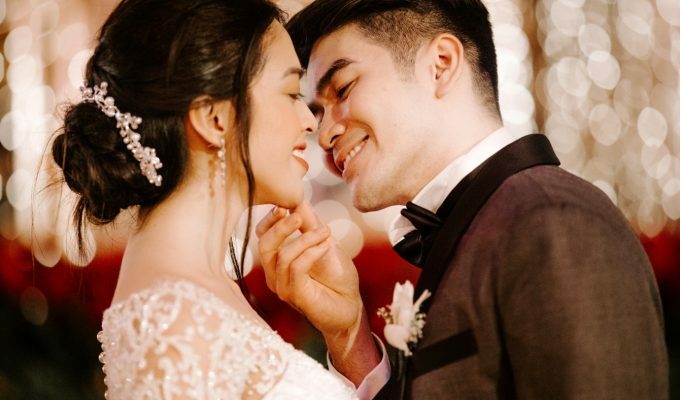 Rather, a romantic getaway filled with personal touches delivered with genuine warmth, care and love. Take the food for example. Head chef Craig revels in switching up the menus on a daily basis fusing local Creole flavours with global influences. There are two top-rated restaurants on site, the sophisticated Cliff on the Cap with panoramic views over the ocean and the Naked Fisherman located down on Smugglers Cove, the pretty crescent-shaped beach. As vegetarians, we’ve often found that our choices on holiday can be limited. Green salad, anyone? But, here, Craig rustles up inventive dishes with gusto, many of which are off menu. One of our stand-out meals was a specially curated veggie tapas extravaganza served at the Cliff on the Cap. The three-courses consisted of deliciously dinky dishes such as organic mushroom risotto, sweetcorn and vanilla veloute, watermelon crudo with cucumber salad, tomato tart Garden pesto (with herbs picked fresh from the hotel’s garden) and crispy yellow pea ravioli. At the end of the night, we worked off our trio of decadent desserts with a spot of impromptu dancing to the brilliant jazz band who’d been serenading us that evening. And that’s the beauty of Cap Maison – it’s a hotel where anything feels possible. If you don’t fancy eating dinner in the restaurants then they will arrange private meals in your room, on the sandy beach, in their boat, within the tropical gardens, on your rooftop – wherever they can pop a table! Why? Because despite its luxurious surroundings, the team pride themselves on creating a home from home feel. And, as the hotel only accommodates around 98 guests, you never feel on top of each other. There are numerous cosy spots to escape, sit back and drink in the views. 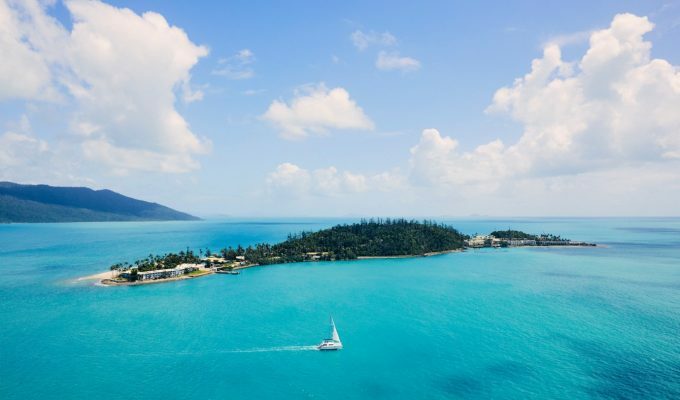 One of our faves was Smugglers Point – a pretty gazebo perched on the edges of the lush tropical gardens with sweeping views across the coastline out towards the rugged peaks of Pigeon Island national park. 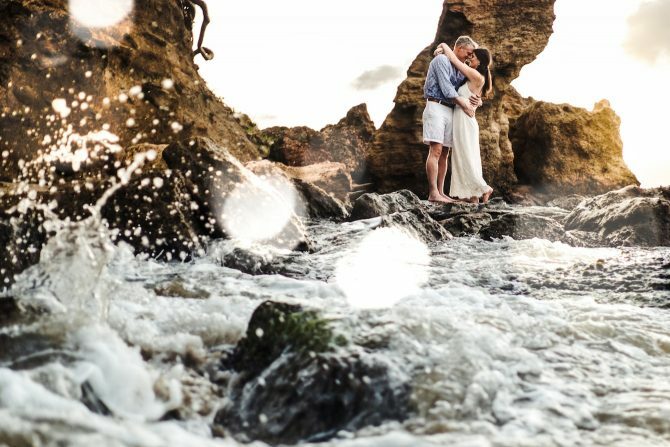 Surrounded by natural beauty, it’s little wonder that Smugglers Point is one of Cap Maison’s most popular wedding venues. 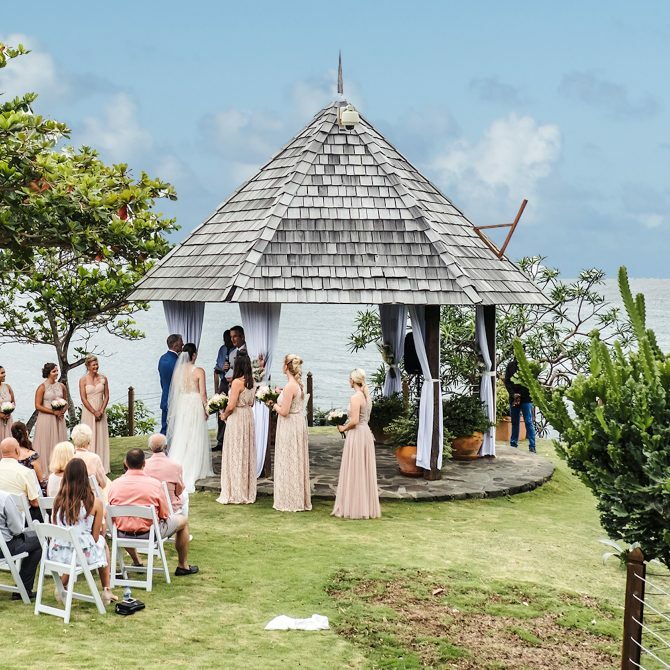 And as Guest Relations Manager Meriah Gaston-Ebbin explains couples tend to keep their wedding decoration simple so the stunning backdrop can do the talking… “I’ll often be asked to dress the gazebo with delicate native flowers or draped with white linen which billow out dramatically like the sails of a boat,” she says. One of those services is the hire of Cap Maison’s private yacht. A trip to the West coast is popular with newlyweds and honeymooners to capture stunning photographs with the islands majestic Piton volcanic spires. Though separate, the two peaks look like they’re joined in union. 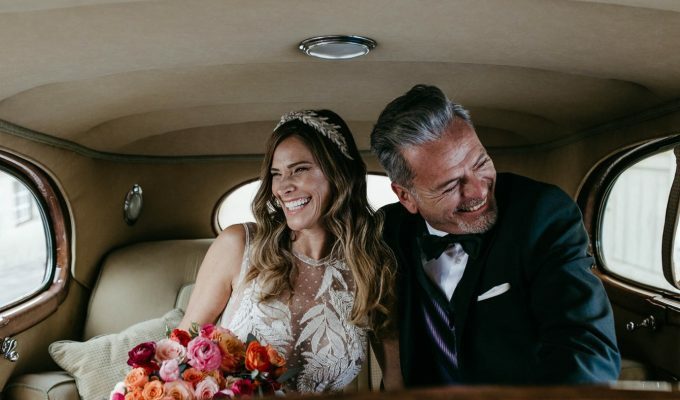 Ahhh… “It’s so romantic, couples love to have pictures taken there,” says local wedding photographer and tour guide Carlton Albertie as he drives us through the winding countryside dotted with avocado trees and rainbow coloured houses to Rainforest Adventures. There, we board a green aerial tram – like a cable car – and take a ride high amongst the rustling treetops to take in breathtaking views over the island. After, we decide to go and see these legendary Pitons for ourselves so the hotel help us book a boat ride to the West. From the sea, we get magnificent views of the twin peaks which are located in the picturesque region of Soufriere. A favourite holiday spot of stars like Oprah, this area is also home to beautiful waterfalls and the famous Sulphur Springs – a Volcanic site – with its purifying mud baths. During the ritual, popular with honeymooners, couples first bath in hot fresh spring water before smothering themselves in mineral-rich mud. It’s washed off to reveal instantly glowy soft skin. It’s said to have therapeutic qualities, perfect for soothing mosquito bites, and eczema, but as we watch the giggling rosy-cheeked pairs emerge from the baths, I reckon it’s just a fun way to get up close and personal! Back at Cap Maison, there’s plenty of other fun activities to indulge in. Our wine tasting and Maison Deli Dinner evening hosted by General Manager and sommelier Ross Stevenson is the perfect way to unwind. In the hotel’s private wine cellar, lined with an impressive collection of 2,000 new and old world bottles, Ross guides us through an array of eclectic wine and blind food pairings. We end with a snifter of the hotel’s own 10-year smokey cask-aged rum… Unsurprisingly, in the party spirit, we head to the famous Friday-night Jump Up! Street party in the neighbouring town of Gros Islet. There, we join locals and tourists for dancing in the street as reggae booms out of the large speakers and vendors sell the famous Piton beer and lip-smacking street food. As the heavens open, we decide to call it a night and escape back to the sanctuary of our beautiful villa at Cap Maison, located on the most Northern tip of the island within the exclusive Cap Estate. 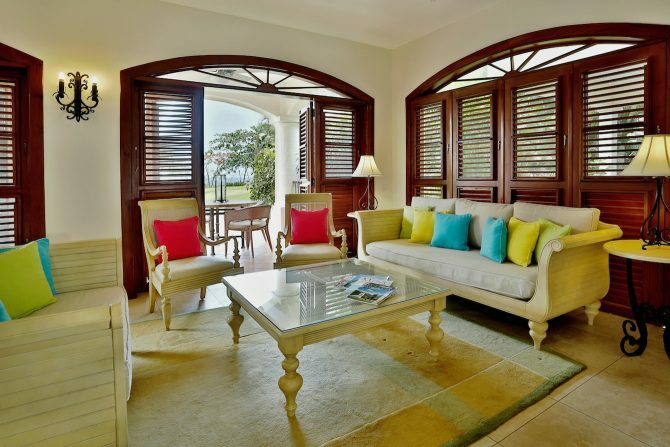 Each of the 49 villa suites have been individually designed drawing on Mediterranean and Moorish influences. Our garden suite is bejewelled with evocative local artwork, pretty hand-painted tiles from Mexico and the softest bed sheets I’ve ever sunk into. Each morning, we make ourselves a cup of tea snuggled in Cap’s sumptuously soft bathrobes and sit on the balcony enjoying the tropical gardens and sweet birdsong. If we fancy a dip, we’re literally a few stepping stones away from one of two of the hotels shimmering pools. It’s so serene, like a personal oasis… bliss. We end our week with a soothing couples massage followed by an expertly shaken minty mojito perched on wooden bar stools at the Naked Fisherman beach bar. And as we gaze out over the sun-dappled ocean, the sand tickling our toes, it feels like we’ve found our very own island paradise. 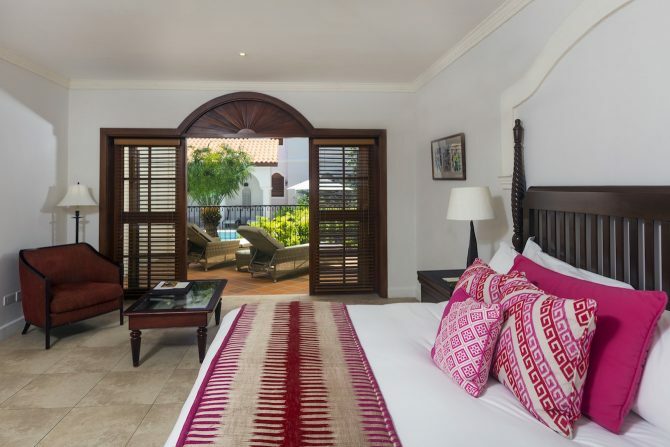 Honeymoons room rates at Cap Maison range from £270 per night for a garden view room in low season to £1,600 a night for a 3 bedroom villa in peak season. · 1 hour couples massage at Spa Maison. · Valid: for stays completed between 03 January and 19 December 2017 & 2018 in 1-bedroom villa suite categories. Wedding packages start at £900 and to hire out Cap Maison exclusively costs from £16,000 per day. Direct return flights from London Gatwick to St Lucia Hewanorra available from TUI and British Airways from as little as £300. With thanks to the Saint Lucia Tourism Authority for the Aerial Tram and Jus Sail Charter experiences.